First off, I must start by saying that I may be a little biased when reviewing this anime because I'm totally a sports anime fan. And having watched quite a number of sports animes, Over Drive came as a refreshing change for me. The race (there is only one) in the anime is surprisingly exciting and interesting. I just could not stop watching episodes after episodes of the race. I mean, a race of bicycles must be boring, right? NOT. Though it lacks special effects that other sports anime have, the scenes are realistic and appealing. Furthermore, character development is cleverly embedded into the series by means of flashbacks during the race. You can get more than a glimpse of each main characters during the short 26 episodes, which is quite satisfying already. From the flashbacks, you learn why they enter the sport and why they are so passionate about it. And throughout the race, you enter into the anime and star rooting for all the characters unconsciously because all the main characters are so likable! The art is very simplistic in this anime, but easy on the eyes, and I came to like the art style a lot. Not too sure about this, too absorbed in the story. Loved it! An anime that can capture my attention for almost all the episodes, and make me sit up and watch is certainly an anime I enjoyed much. I would recommend all to watch this anime. It's comical at the right times, and touching at others. But I must say that the story borders on corny at times, but fret not, it doesn't happen often. And I am dissatisfied that the series is so short, I wished it continued on longer and showed us their journey through the Tour de France. Maybe in their next season? This anime is about a boy who finds out the joy and romance in riding a bicycle. From the time he first rides his bicycle to his first race. The story is unique in that its not everyday you have an anime about bicycle racing. What makes it so interesting is how they make bicycle racing sound so epic and how some unknown little loser can come out as one of the best. Like how they have different types of bicycle riders, climbers,sprinters,down-hil specialists,all rounders and so on.Although i felt that for an anime with romance as one of its genres it was quite a letdown as the romance was very suttle. The artwork is good i guess,i dont really take into account the artwork so much but i feel that it was sufficient to bring out the action of the race. The Opening song was very upbeat and i was quite taken in by the song though i can't say the same for the ending song. I think that if they had put inserts in the anime it might have enhanced the feelings or the mood. The chracters were fabulous. In this anime, there are quite a lot of main characters, this is because many of teh characters has a fair share of showtime in the anime anf this makes it more realistic, instead of just focussing on one or two characters. Each of the main chracters is adequately expressed and their pasts help to enhance their feelings and justify their determination. I was particularly inspired by the main chracter's spirit in not giving up. the uspport characters do a good job in giving the respective chracters a feeling of reverence and respect and this is important in a show where people are constantly competing to be the best. So i feel the character development was especially evident for the main chracter and is one of the best i've seen. The anime had its fair share of laughs and suspense which makes quite a good combination. I was quite enthraled by the anime for its comic relief as well as its constant cliff-hangers.Once you start watching its hard to stop especially when it come to the race.The story was quite realistic and this allows the audience to empathize with the chracters and this also drew me in and added to my enjoyment. In my opinion, the anime is well worth watching and if you think you don't like it at the start try the later episodes about 10 or so when the race starts, you'll definitely be captivated. Ah, the puberty. A time in which we obsess over teen idols, or get angry about nothing, but above all, a time where we want to be acknowledged. So how does one get acknowledged? The best way, of course, is to prove anyone to be the best in something. After all, victors write history. But it’s losers like Shinozaki Mikoto who are history. 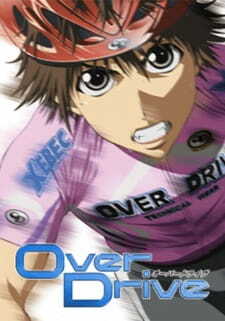 Over Drive follows the protagonist and his journey on the bike, alongside the other members of the Sakura Bicycle Club. Their big dream is to participate in the Tour de France. But of course, it’s a long way until then – first, there are 11 episodes about Shinozaki learning to ride a bike and swooning over his crush Fukuzawa Yuki, introducing Yamato as well as the captain and Yuki’s brother Yousuke. Needless to say, it’s too long, and in my opinion a chore to watch. Once we get to the race – which is pretty much the rest of the show – the pace picks up, very slightly so though, because not only that the race is dragged on, there are also flashbacks which make the race even longer. There’s even a meaningless filler which takes the entire second half of one episode, and that goes too far for me. The race itself was pretty unrealistic in my eyes, especially when I take Shinozaki into regard. In the first two episodes, he wasn’t able to ride a bike, and twenty episodes later, he is suddenly able to win a checkpoint. What’s even worse is that it is mentioned in a flashback that Shinozaki used to ride a bike as child. That makes the whole beginning part illogical. And how was he able to evolve into such a good rider in such a short amount of time? There is only one thing I consider to be kind of realistic, and that is the way the race ends for him – but that’d be a spoiler. The other racers are very generic character for a sports anime. We have Yousuke, who’s an arrogant captain who thinks he doesn’t need a team, and of course he changes his ways over time. There’s Shinozaki’s friendly rival Yamato, who’s the usual cool and aloof character with, of course, the corresponding flashback. There’s the inconsistently written crush Yuki as well as the antagonist Hyoudou, who’s also pretty generic. And then there’s Yousuke’s assistant Terao, who gets fleshed out and developed only in the very last part of the show, and it’s truly a shame because by the time he does get fleshed out, we see that he isn’t really a generic assistant. The whole cast and their interactions feel awkward, and by the time the cast is likeable, the show is over. At this point I can’t even determine what the worst part about Over Drive is, but the cast plays a big role in my low enjoyment. The soundtrack is not very good either, mostly because no tracks quite fit to the mood, save the fiery guitar riffs that weren’t often played, sadly. The soundtrack sounds like it came straight from the 90s. 90s sound is generally not a bad thing, but if it’s a background music to something what’s supposed to be a fiery battle, then it is a bad choice. The opening is very good, the endings were alright as well, but what’s truly worth mentioning is something else. In Yamato’s flashback, he is supposed to be in France and have language problems. In France, people speak French, right? Not in Over Drive, because they were all talking Japanese. So it made it look like Yamato has trouble processing what he hears or him simply being deaf. Needless to say, it was ridiculous, very much so. The other aspect that had poor budget was the animation. It was from 2007 and the animation is aged, yes, but the CG still looks awkward and bad. My enjoyment level was, as previously mentioned, not the highest. The first eleven epiosdes were plain boring to me. The race was a tad more enjoyable and I genuinely enjoyed the flashbacks between Yousuke and Terao. The theme of being the strongest and the desire to be acknowledged by friends and elders is not the most unique, not even to sports anime. The way it was presented was good at times, but not very much for the most part. Overall, Over Drive is a sports anime that sounds average in theory and sub par in practice. The characters are generic and average at best for the most part, some developments simply unrealistic, and the sound not very fitting. Its themes are nothing new and the CG animation bad. There are very little redeeming values to this show, such as a tad more enjoyment in the race and some character development for one character only as well as a nice opening. Should you watch Over Drive? No. There are better anime out there, and certainly better shows in this genre. Because sadly, even though losers are history, there’s a reason why they’re forgotten. Story : Is a nice story, and tells a lot about real cycling. It mentions things from real cycling, and thats positive, well, is not exactly like real cycling, but its not soo far at all. However, sometimes is a bit boring, but still nice! art: nothing special, but not so bad to give less than a 7.
sound: Well, sometimes it is a bit irritating, however i consider it not bad, so 7. Character: I considered then well develloped, the anime mentions a lot of things about the charathers and thats good. Well, i didnt like some characters (yeah it normal, there are the ones we like and the ones we dont) but they are not really that bad, 8 sound nice. I will be sincere. When i decided to watch this one, i told to myself...well i don&acute;t think this will be a nice one, maybe for a 6 or something like that, but the fact is that when i watched the first episodes, well, i couldn&acute;t stop watching till the end..i consider it a nice and entretaining show. overall: Well, this anime really surprised me, i usually don&acute;t watch sport related anime, but after seeing this one i might reconsider that option. Well, its not the best show i ever watched, but it was worth the time.. 8..
Yowamushi Pedal, Kuroko no Basuke, Baby Steps, Haikyuu!! - modern anime fans are spoiled for choice. But there's a lot of other great sports anime out there just waiting to be discovered.